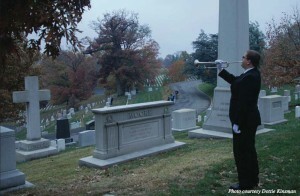 Sound the bugle: Music junior Joseph Kinsman plays at the Arlington National Cemetery. The 50th anniversary for JFK’s funeral was held on Saturday, Nov. 16, with Kinsman playing the bugle along with 99 others. On Saturday, Nov. 16, Cameron University Music Junior and Kappa Kappa Psi President Joseph Kinsman attended the observation of the 50th anniversary of the funeral for President John F. Kennedy. Kinsman was invited to the Arlington National Cemetery to preform as a bugler in JFK’s ceremony. There were approximately 100 buglers at the event. Kinsman said that on the morning of the ceremony, they sounded the bugle call numerous times: the first time in unison, the second time in a four-part harmonization and the third time at their pre-assigned areas throughout the cemetery. Kinsman was set to play his call at the Tomb of the Civil War Unknowns. He explained the significance behind the bugle call. At President Kennedy’s funeral, Sergeant Keith Clark sounded the call. At the end of the second phrase, he cracked a note. The country referred to this as the trumpet crying, and sentiment was attached. Kinsman was invited to the Arlington National Cemetery to honor not only President Kennedy, but to play in remembrance of this call. “Playing in honor of President Kennedy, who was the second president to get assassinated, it’s a very special thing. 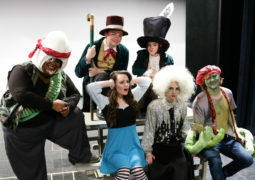 It’s something that doesn’t happen all the time,” he said. Kinsman started bugling five years ago. According to him, it was an event held in the Ft. Sill National Cemetery in 2008 that started his music career with Taps for Veterans. However, his love for music was a gene that he inherited from his family. His father, brother and sister all played musical instruments at some point in their lives. His main reason for playing the trumpet is to recognize his father. He also recalled that there was someone farther away from home than expected for whom he played. Chin Sun Pac Wells, a 1995 Eisenhower graduate, was buried at Arlington after being killed in the 9/11 attacks on the Pentagon. “It was neat to know that I wasn’t just playing for family and soldiers in general, but also someone from right here at home,” he said. Kinsman affirmed that bugling is something close to his heart that he will continue to do for the rest of his life. He believes that all soldiers deserve to have a live bugler at their ceremony as opposed to a recording of someone playing the Taps call.